Honor Roll Member – Edmundson, Wade Wesley « Perry High School Alumni Association, Inc.
Wade Edmundson was born on June 11, 1951 in Stillwater (son of Lois and Dr. Paul Edmundson) and attended Perry public schools K-12, graduating in 1969. He received a B.S. in business at OSU in ’73 and MBA also at OSU in ’76. In 1984, he graduated from the Southwest Graduate School of Banking at SMU. Wade is currently the Chairman of Commerce Bank, Oklahoma, part of a $26 billion, multi-state bank headquartered in Kansas City. Edmundson has over 40 years of Commercial Banking experience, all of which have been spent in the Oklahoma market. 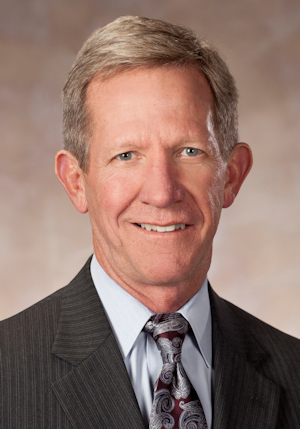 He previously held positions with Bank of Oklahoma, Bank IV (formerly Fourth National Bank) and First National Bank of Tulsa. In 2002 he led a group of organizers to form Summit Bank, which targeted businesses and professionals in the Tulsa and Oklahoma City markets. Then in September of 2013, he led the sale of Summit to Commerce Bank. Edmundson serves on the board and is past chair of the Tulsa Regional Chamber, an 1800 member northeast Oklahoma business organization. He also serves on the Advisory Board of Youth Services of Tulsa. He is past chair of the Tulsa Red Cross and past president of Youth Services of Tulsa. He has also served on the board and been chair of Downtown Tulsa Unlimited and the Summit Club (private restaurant/club). He also served on the boards of the OSU Alumni Association and Oklahoma Banker’s Association. He is a graduate of Leadership Oklahoma and served on the board of that organization. Wade and his wife, Charlotte, chaired fundraising events for Youth Services of Tulsa and the Salvation Army, leading a total of $1.1 million for the Army in a program featuring Bob Costas as speaker. Charlotte and Wade have served on multiple non-profit fundraising event committees, including Tulsa Ballet, Tulsa Red Cross, and OSU Tulsa. Wade and Charlotte have two children, Ryan, 29, in New York and Erin, 26, in Tulsa. Brother, Todd, also a graduate of Perry High, lives in Dallas.